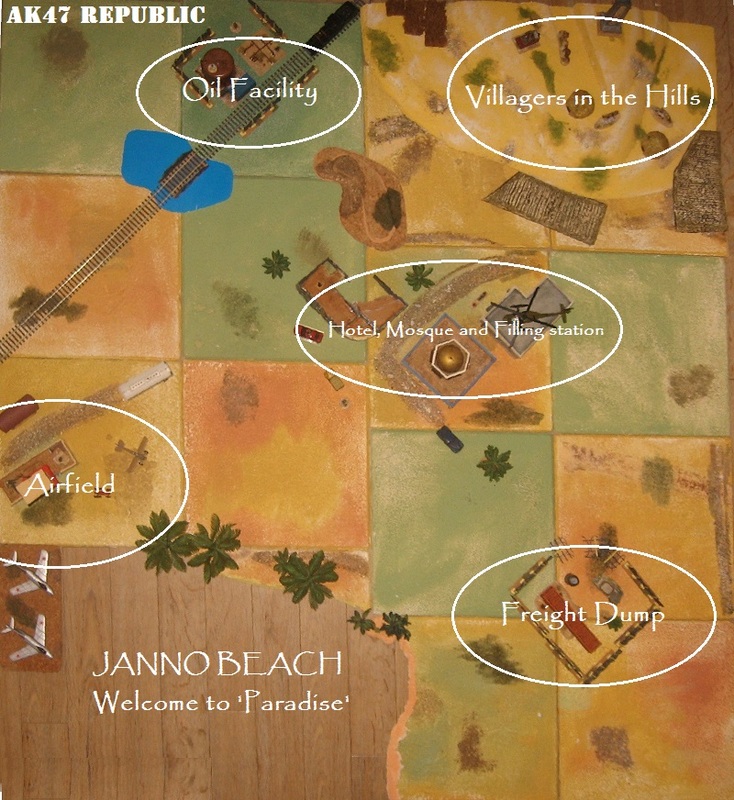 ‘Janno Beach’ might be any bit of tempting coastline from Sierra Leone to Somalia … sun, sea and palm trees … but times have moved on and the Soviet funded tourist hotel is but a shell … there are MiG fighters on the nearby airfield but no pilots … the villagers stay up in the hills. Then again, you might be able to rent some speed boats from the local pirates. Imagine, in a different world, this might be a beautiful tourist bay boosting a buoyant modern economy. Perhaps inevitably, they failed in a final bid to hire ‘Mad Rupert’ and his mercenaries! 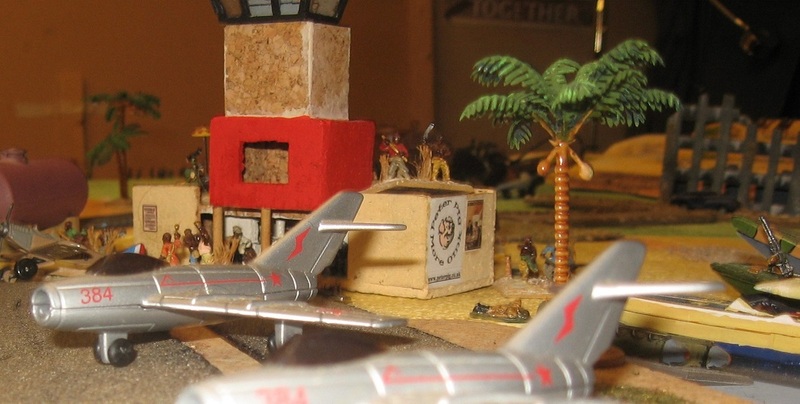 I played Panto and nominated the Freight Dump, Mosque and Airfield as my objectives. 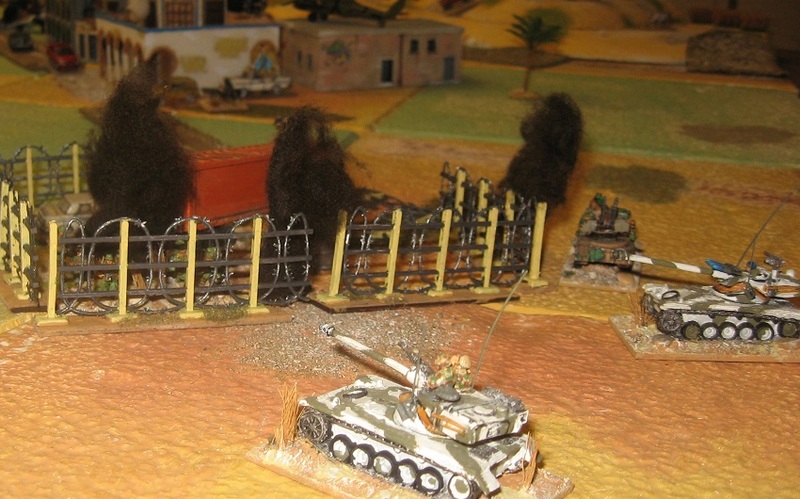 Panto: Professional HQ of the General, 1 SA, 1 APC with AA gun; 2 Regular (T55) tanks; 1 Professional (Hind) attack helicopter; a Regular army unit of 4 SA, 1 RPG, 1 (Unimog) Truck RCL*, 1 Truck with AA gun; and Panto’s (militia) Women’s Revolutionary Volunteers, comprising 5 SA, 3 mortars, 1 RPG, 1 (Toyota) Truck with RCL. 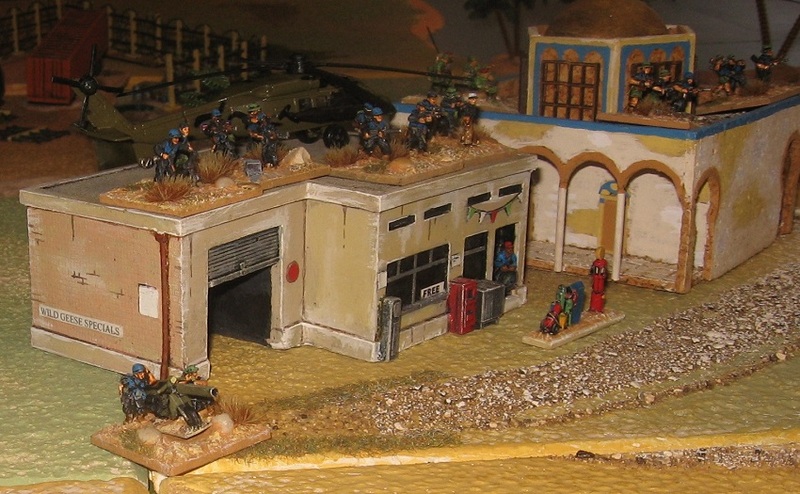 *(actually a Vespa 150 TAP) – the recently accessioned Paras de Panto were on their first tabletop mission. ***actually a biker gang but at Janno Beach they traded their bikes with local pirates for some speed boats in order to raid the airfield from across the bay. Frap stationed the Paras in the town centre (which they secured throughout the day) and the only army unit to show up at the airfield. 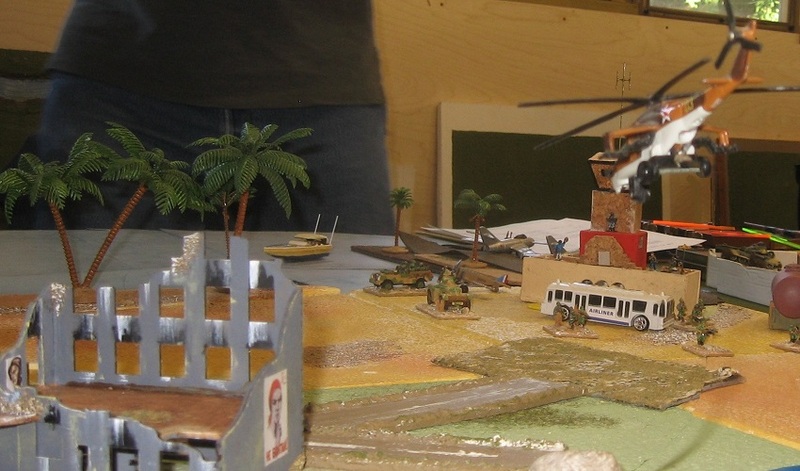 Panto came in from the village/oil facility end of the board with the women’s militia, the helicopter and a solitary T55 (there being no fuel to run the other one). The attack immediately faltered … whilst routinely acquiring targets over the battlefield, the prize Soviet-funded Hind helicopter – almost indestructible, they said – was taken down … seemingly by a group of paras who had set up a mortar on the Gas Station roof … Had they hit it with an almost vertical bomb shot? Did they also have a light AA missile in their kit? Was it a catastrophic failure triggered by small arms fire? We will doubtless never know: the big beast came down out of the sky in a ball of flame. 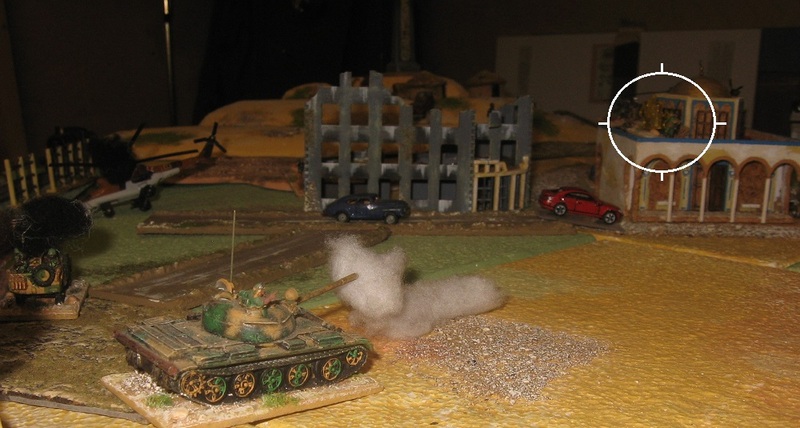 The situation might have evened itself up over the succeeding turns … Panto’s T55 had driven into the centre ground (in part to avoid the para’s Vespa/RCL and RPGs who were making the cluster of buildings look a real nest of vipers) … and was getting some good shots in on the enemy softskins … although badly matched against the regulars now debouching from the Airfield, the women’s militia were successfully pinning them down with mortar fire. 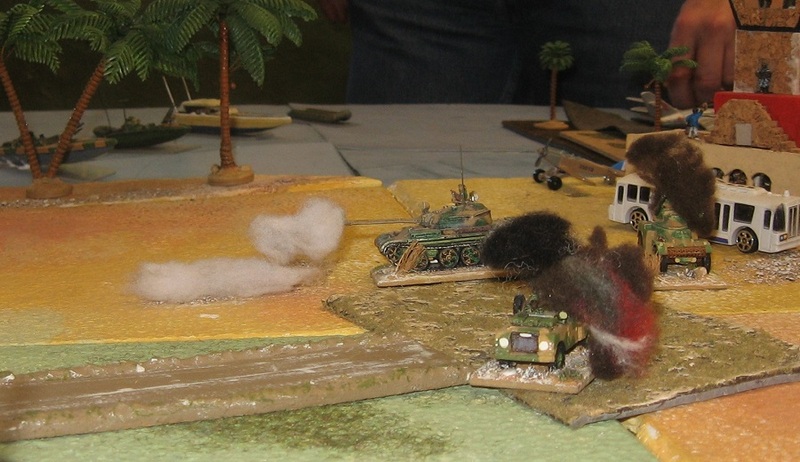 … and the battle seemed to swing: Frap’s regulars and Panto’s militia both disintegrated (the militia ultimately couldn’t handle the better quality soldiers but the T55 and mortar fire had reduced the enemy regulars to tatters in the process), Panto’s commander (frustratingly on foot due to that Sanctions/fuel problem) turned up at the now vacated Airfield and grabbed the objective … meanwhile the sole T55 zeroed in on the top corner of the mosque from which Frap’s commander was running the show … Kaboom! It was a race against time … the Frap biker gang turned up … this time in speed boats … and diverted across the bay towards the Airfield (which was only being held by the commander and his bodyguard SA group). 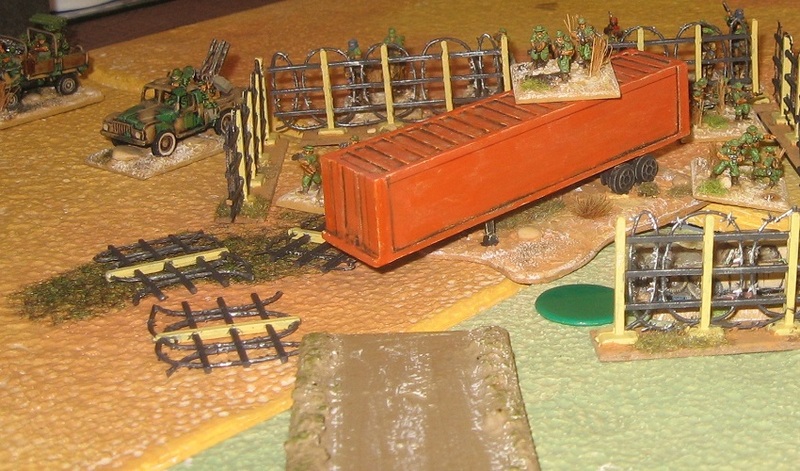 The Panto camel raiders, meanwhile, had arrived and took control of the Freight Dump. 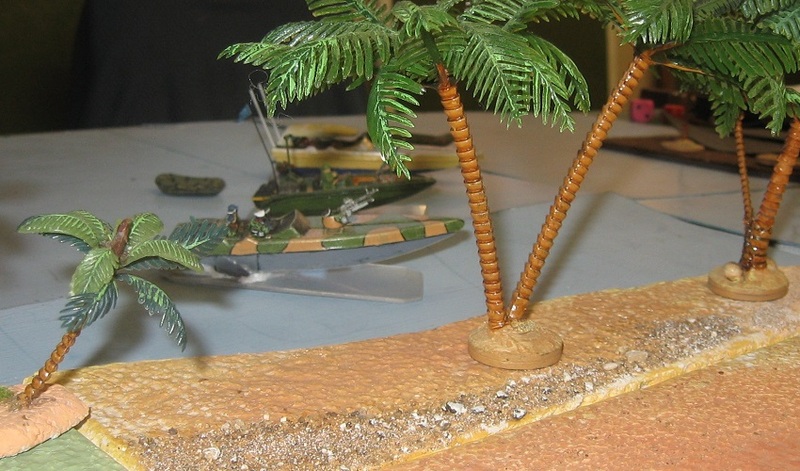 So, in order to help out at the Airfield, the T55 commander turned his attention to the speed boats … firing at them but hitting none (well at least that saved us inventing a rule for occupants bailing out of a burning vehicle – the standard AK47 result with a brewed carrier – into the sea)! 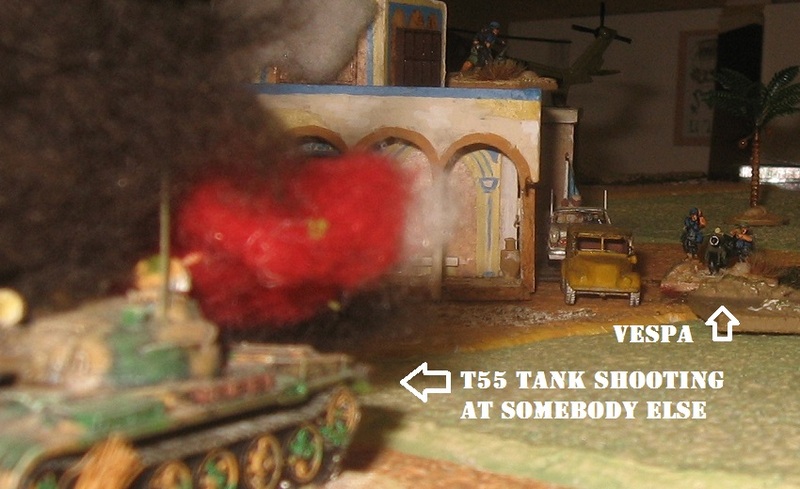 At which point that Vespa emerged from behind the Mosque and spanged an RCL shot off at the tank! … and blew it to bits with a dice roll that didn’t even need adding up! 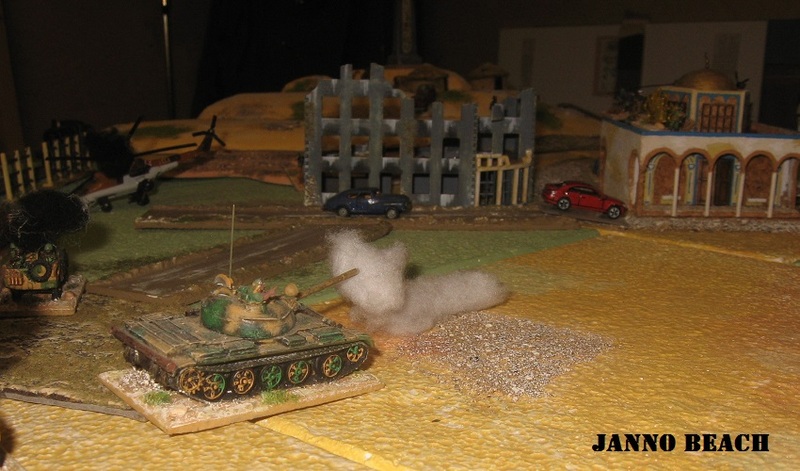 Of course, this is one of wargaming’s ‘champagne moments’ … I’d really only built the little TAP scooter model out of curiosity (and scarcely could have imagined it would bag a T55 on its first outing on the tabletop). The random turn count just kept the game going long enough to let all this happen – and give Richard, in his first full game of AK47, a resounding victory. As he was new to the full game we ran through the scoring system (despite the victory being clear) and for aficionados, Frap scored over 120 points. Vive le Frap! 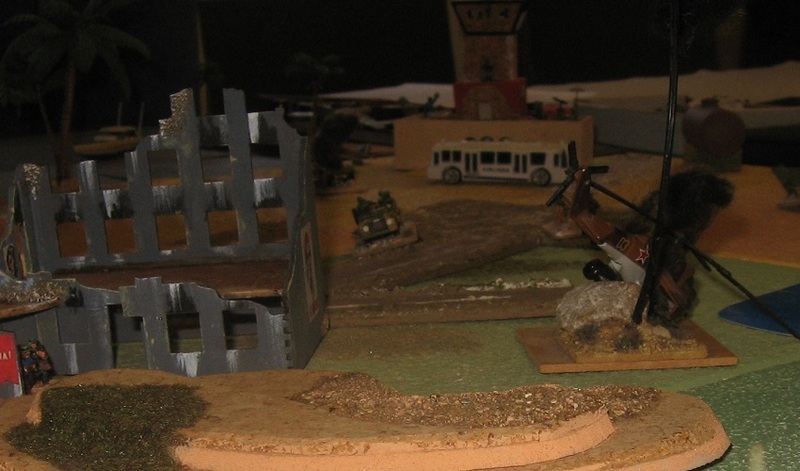 It as a pleasure to play on such atmospheric terrain = the “narrative” was in good shape just from the set up, even before mortars brought down the whirly bird, the T55 took out my commander on the balcony of the mosque, my militia made their speedboat assault on the airfield and the Vespa RCL brewed up your little tank. As a first full game of I can’t imagine bettering this. Huzzah! Another voctory for the anti-aircraft mortars! Doctor Evil was there in spirit. Sounds like an excellent game. Phil.